Background: Percutaneous endoscopic sleeve gastroplasty (PESG) may have a role as a restrictive weight loss procedure. We hypothesize that we can safely perform a durable PESG using full thickness endoluminal plications. Methods: After developing the PESG on ex-vivo porcine stomachs and 6 non-survival procedures, we tested the durability by performing 6 survival procedures on 30 kg pigs under an IACUC approved protocol. The first step is to place a 24F PEG using a standard pull technique through the abdominal wall in the left mid-clavicular line. 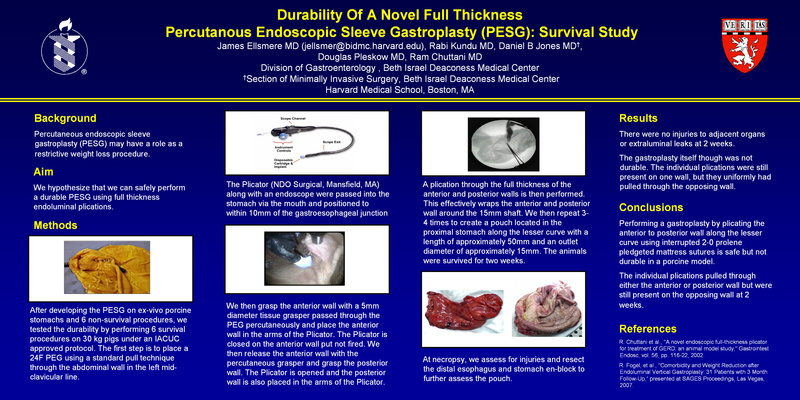 The Plicator (NDO Surgical, Mansfield, MA) along with an endoscope are then passed into the stomach via the mouth and positioned to within 10mm of the gastroesophageal junction. We then grasp the anterior wall with a 5mm diameter tissue grasper passed percutaneously through the PEG and place the anterior wall in the arms of the Plicator. The Plicator is closed on the anterior wall put not fired. We then release the anterior wall with the percutaneous grasper and grasp the posterior wall. The Plicator is opened and the posterior wall is also placed in the arms of the Plicator. A plication through the full thickness of the anterior and posterior walls is then performed. This effectively wraps the anterior and posterior wall around the 15mm shaft. We then repeat 3-4 times to create a pouch located in the proximal stomach along the lesser curve with a length of approximately 50mm and an outlet diameter of approximately 15mm. The animals were survived for two weeks. At necropsy, we assess for injuries and resect the distal esophagus, stomach and the proximal duodenum en-block to further assess the pouch. Results: There were no injuries to adjacent organs or extraluminal leaks at 2 weeks. The gastroplasty itself though was not durable. The individual plications were still present on one wall, but they uniformly had pulled through the opposing wall. Conclusion: Performing a gastroplasty by plicating the anterior to posterior wall along the lesser curve using interrupted 2-0 prolene pledgeted mattress sutures is safe but not durable. The individual plications pulled through either the anterior or posterior wall but were still present on the opposing wall at 2 weeks.